From its source in Donaueschingen to its mouth at the Black Sea, the mighty Danube cascades through ten countries. In fact, there is no other river which connects so many different cultures – no wonder it has inspired musicians, poets, writers and artists throughout the centuries. It has also inspired chefs and restaurateurs – and to experience a real culinary journey along the Danube, the best place to visit is Vogue. 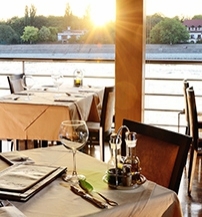 Permanently located at the Carl Lutz quay – the riverbank on the Pest side, the ship-restaurant offers a menu card that is unique in Budapest. 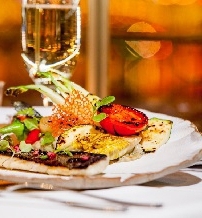 Its four sections introduce the cuisines from the countries that line the Danube banks, with Hungarian, Mediterranean and South-Slavic dishes. Chef Sosic Slobodan approach to this challenge isn’t experimental – he sticks with traditional, authentic recipes and cater to those who appreciate a decent, hearty meal with maximum flavor. As for the ingredients: even the all-time favorites are subject to change a little with the seasons. On my visit, the menu clearly reflected the late spring with fresh strawberries and zesty greens on the plate. 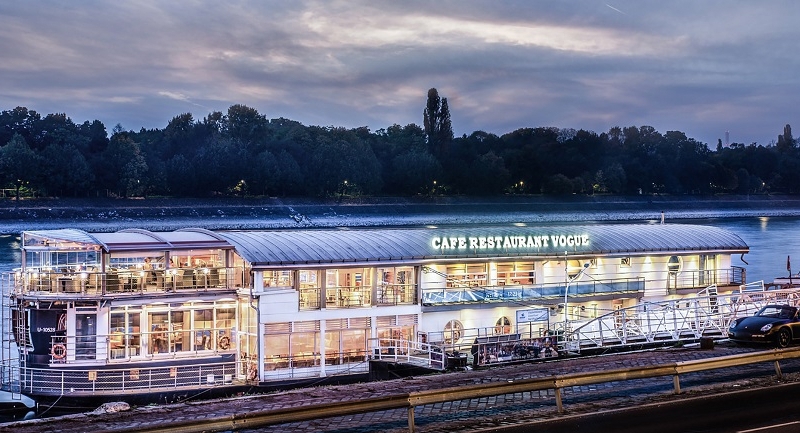 Due to its superlative location, Vogue is a great place to meet and unwind: although you are in the heart of the city, you don’t hear the noise of the traffic – it is an intimate zone where you can sip a cocktail with friends and admire the sun set over Buda castle. I find these relaxed moments enlightening: watching the runners doing their rounds on Margaret Island, I feel an instant rush to start a healthier life. The wine selection is something Vogue is particularly proud of, and with good reason. There’s an ample repertoire of reds and whites, carefully selected from the best cellars in Hungary and neighboring countries – to suit all the dishes on the menu. My goose liver terrine that came with strawberry- rhubarb sauce was paired with a Sole Rosé from the Transylvanian winery Recas – and they worked beautifully together. The knowledge of the wines, the attentive and prompt service, the unusual Slavic flavors, the laid-back atmosphere and the gorgeous panorama – this combo won’t leave you disappointed. Mooring opposite Margaret Island on the Pest side, Vogue has many features. There is a range of seasonal deals, special menus and events running throughout the year, mild jazz concerts and brunches for "little pirates”. The iconic ship is a frequented event-venue, hosting corporate events, trainings and press conferences on a regular basis, so we advise you to book your table. Following a re-design, the interior is updated and fitted with wood paneling, and lots of glass surfaces, for a contemporary look. The multiple function and event spaces can now accommodate up to 240 people, or seat 130. 1137 Budapest, Carl Lutz rkp. 1.